Alhagi maurorum is a species of legume commonly known, variously, as camelthorn, camelthorn-bush, Caspian manna, andPersian mannaplant. This shrub is native to the region extending from the Mediterranean to Russia, but has been introduced to many other areas of the world, including Australia, southern Africa, and the western United States. The perennial plant grows from a massiverhizome system which may extend over six feet into the ground. New shoots can appear over 20 feet from the parent plant. Above the ground, the plant rarely reaches four feet in height. It is a heavily branched, gray-green thicket with long spines along the branches. 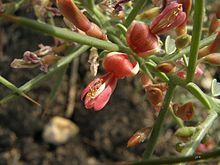 It bears small, bright pink to maroon pea flowers and small legume pods, which are brown or reddish and constricted between the seeds. The seeds are mottled brown beans. Alhagi maurorum has been used locally in folk medicine as a treatment for glandular tumors, nasal polyps, and ailments related to the bile ducts. Uses : It is used as a medicinal herb for its gastroprotective, diaphoretic, diuretic, expectorant, laxative, antidiarrhoeal and antisepticproperties, and in the treatment of rheumatism and hemorrhoids. The plant is mentioned in the Quran as a source of sweetManna.